by now you should know this favorite time and calorie saving trick of mine - 12 ounces carbonated beverage plus boxed cake mix (just the dry mix, nothing else) makes cupcakes. it is just that easy. soda, beer, champagne, just mix it with dry cake mix and it'll bake right up. 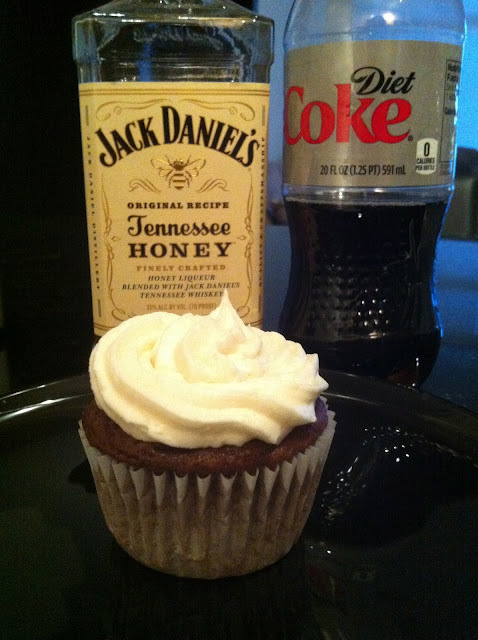 so that's step one of the easiest jack and coke cupcakes you could ever make. i.e. perfect for the last minute father's day dessert. mix 12 ounces coke or diet coke (or pepsi if that's your jam) with chocolate boxed cake mix. two ingredients, you know you love it. mix them until the batter is just a bit lumpy, and place into liners in a cupcake pan. bake according to directions on your box, usually around 16 minutes at 350 degrees. always go the lower of the time suggestion, this is how you keep them moist since they continue to cook while in the hot pan (duh) even after you pull them out of the oven. allow them to cool completely, undoubtedly the longest time period in this whole recipe. for the frosting, beat 1 and 3/4 sticks of room temperature butter in a bowl for about 1 minute. slowly add 6 cups of powdered sugar, 1 teaspoon vanilla extract, and 1/2 cup honey jack daniels whiskey. beat until creamy. link up your posts with chelsee and i! pretty much anything party related goes. Omg...you had me at Jack! These look amazing!!! I'm moving in with you so that you can bake me cupcakes (with alcohol, duh) every day. Too bad I'm trying to lose weight and cut out alcohol, diet coke, and bad food until I feel I can indulge without going overboard. This post is full of things that I absolutely love and now I'm just sad. I'll have you know that I will think about these damn cupcakes, with my mouth watering, the entire time I'm working out tonight. Jerk. just kidding, you're not a jerk and I still love you.. I'll make it for you!!!! Aw man I'm missing cupcakes this weekend?! Dang! This look awesome though! This looks and sounds great, yum! Friday is Greg's birthday. I think you just gave me an idea. Gonna have to show my mom this one, we might just have to do them! Omg I bet these are delish! honey jack and diet coke are two of my faveorite things. I would drink them all while making those cakes....you are a stronger woman than me! Ahh! These look so delicious! I am definitely going to make them for Daddy-O! I really think I might have to try these this weekend. They look SO good. DC is the nectar of the Gods, and growing up close to Atlanta, I think drinking any Pepsi product is a sin. we should have a bake sale...at a bar;) between your cupcakes and my whoopie pies, we should make crazy money. And when will mine be in the mail? Damn you are my kind of girl. Please feel free to send one of those bad boys to Charlotte, NC!!! holy cow, my little bro loves JD and JD Honey. I'll def have to make these for our next bonfire.. he's going to freak. Dear god these sound amazing. I made skinny funfetti cupcakes with funfetti mix and Sprite and it blew my mind that they came out delicious. Who knew. How do these taste?? Justin has a birthday coming up and these would be perfect! Jackpot! I must make these!!! Nom! FYI - this post has made me unreasonably angry. because i can't open my mouth to take bites of actual food. i'll forgive you. this time. Okay... I think that might have been the inspiration I needed for my step-daughter's husband's fourth of six Christmas present desserts. Thanks! Damn, it's also the Stern German's birthday this week... and Father's Day next weekend... maybe I'll make them in bulk. So... a little advice, please... if I was making a Captain/Coke combo... what cake mix should I use? White? Yellow? Give me your thoughts! 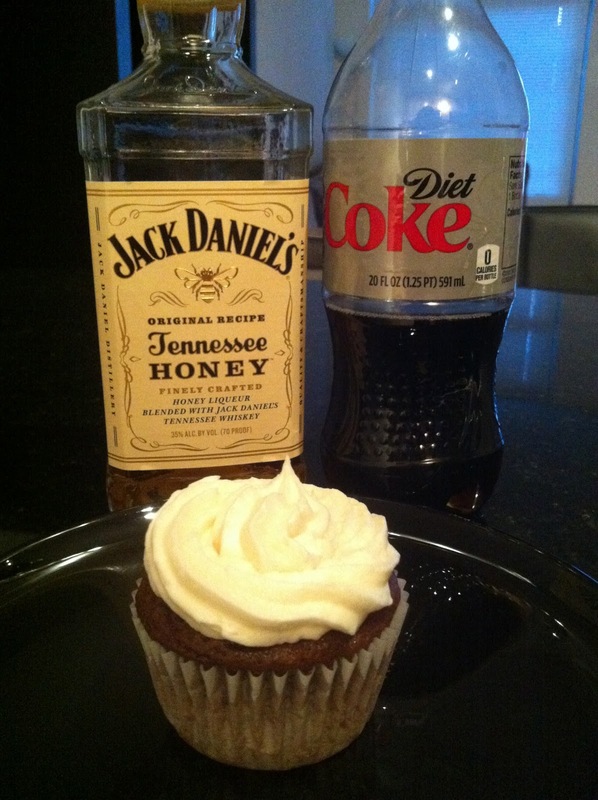 This may be the best booze cupcake yet!